The vies of Trephina Gorge from above. AT reader Jill Sullivan follows the swirling flight of the budgerigar to Trephina Gorge, in the East MacDonnell Ranges. Budgerigars have never held any great fascination for me, until recently. Back in the 1970s and ’80s it was popular for families to have a budgie in a cage. In fact the only budgie I can remember with any clarity is my Gran’s – Billy – who was blue and lived a plush life in his cage near the kitchen window. As a child I imagined he’d much prefer to live in the wild. Today, many aeons after his demise, I’ve just grasped what Billy missed. 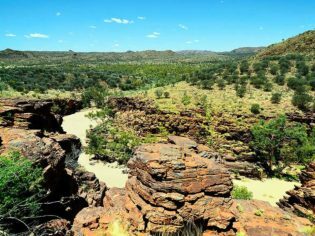 Swamped by long distance driving and the vastness of this country, we set upcamp in the Trephina Gorge Nature Park 85km east of Alice Springs. The gorge campgrounds come complete with toilets, picnic tables and small BBQ plates over designated fire pits, while the gorge itself is composed of sheer quartzite cliffs and a tree-lined watercourse. Late afternoon I find some shade against the boulders at the waterhole where spears of sunlight bounce off the red cliffs and fracture the water with deep reflections. It’s here that I realise the full implications of Billy’s misfortune. I’m spellbound by tiny green shapes wheeling in synchronised movement like whirling dervishes above the shimmering water. Drawn by their continuous chirrup, I follow the glinting flock of budgies and marvel at the provocative colours, luminous greens and yellows. Swirling and dancing, they take turns with the zebra finches to drink from the waterhole. How Billy would have loved it! These striking green budgerigars are native to Central Australia and after good summer rains can successfully breed several times, resulting in a population explosion. The birds are often represented in the artworks of the desert people, including in the unique pottery pieces created by the women from the Hermannsburg Community. Their unparalleled works are produced in a small studio and not only feature this feisty little bird but lizards, animals and plants. As I tear myself away from this waterhole performance and return to our campsite the sun begins to applaud the landscape with an opera of colours and sounds. The billy bubbles over the campfire approaches and the stars, as if on cue, turn on an opulent display. Next morning we pore over walking trail information provided by NT Parks and Wildlife with a view to exploring more. At every turn on the marked Trephina Gorge Walk there are striking photo opportunities. Along the rim precariously positioned ghostly gums stand tall over us while wildflowers nod sedately as we pass – holly grevilleas, desert hibiscus, mulla mulla, hop bushes and cat’s tails. Good summer rains have not only ensured a healthy budgerigar population but a wonderful display of wildflowers too, a glorious profusion of shapes and colours. Trephina Gorge Nature Park is the perfect base to explore further. The old gold mining township of Arltunga and the N’Dhala Gorge Nature Park via the Ross Highway are easy daytrips. The road leading into N’Dhala gorge runs along the bed of the Ross River and is very sandy and rocky in places. The pecked engravings found in the shady gorge region are vital evidence demonstrating Aboriginal existence in this place thousands of years ago. This is an ancient place crying out for exploration. And yes, they’re here too: those flighty green budgies glinting defiantly across the waterhole, flirting with us again. Temperatures hover in the high 20s the afternoon of our visit, and the unsealed road jars and jolts both the vehicle and us for the many kilometres to the Historic Reserve. Rays of afternoon sunlight stream down as we enter the Visitor Centre. Here a fascinating collection of early photographs depicts the struggles endured by those seeking their fortune in this harsh and isolated place. 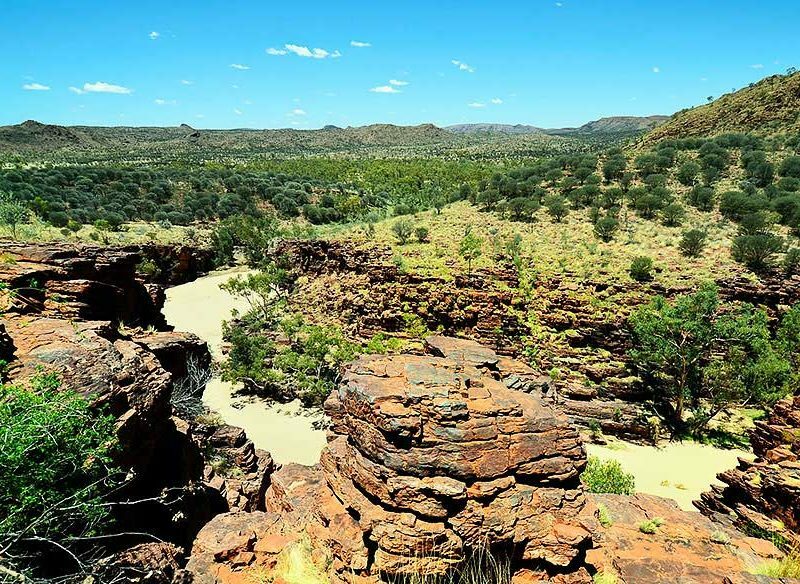 This was officially Central Australia’s first town, after gold was discovered in a dry creek bed in 1887. Life was rough and tough here. Just to reach the goldfields a hopeful miner would have to walk or ride alongside the Overland Telegraph line from Oodnadatta in SA to Alice Springs, then follow the MacDonnell Ranges for about 120km. Much later, after exploring the restored police station and jail, we reluctantly and yet gratefully retrace the drive back to our campsite in our air-conditioned vehicle. Here, in the heart of this incredible country far removed from the hustle and bustle of city life, is a unique space to listen to the silence, walk the country and engage in the whirling, swirling dance of the green budgerigar.